Over the last few years, a growing movement has taken place across New York State. 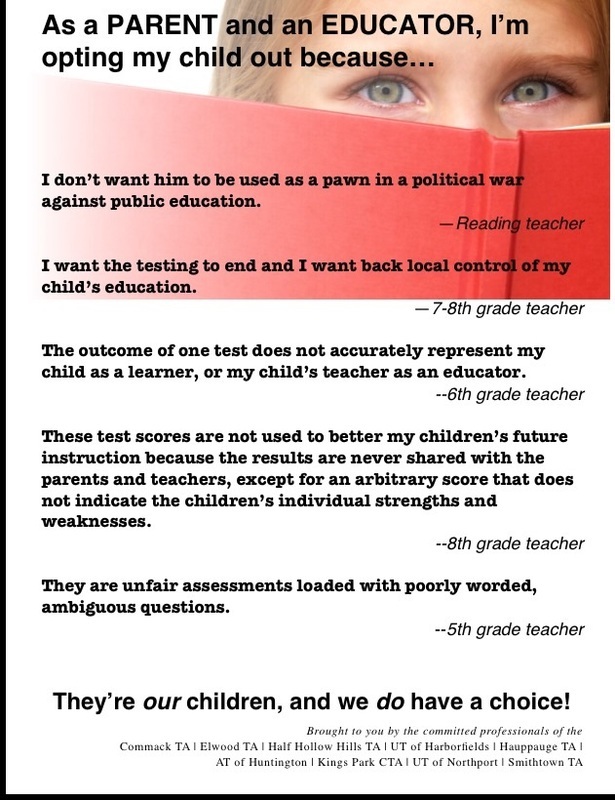 Parents have begun refusing to allow their children to take the grade 3-8 state tests that are given each spring. This movement, referred to as the “Refusal Movement” or the “Opt-Out Movement,” has generated many questions from parents, teachers and students. I would like to take a moment of your time to address some of those questions. While it would be inappropriate of an individual teacher, or the collective voice of a community’s teachers, such as the STA, to advise you on what is best for your child, the STA wholeheartedly supports a parent’s right to refuse these high-stakes tests. Additionally, the STA supports the position that students who “opt-out” of the state tests should be given an opportunity to spend that time experiencing the high-quality instruction that they enjoy throughout the school year in the Smithtown district. It should be pointed out that neither the child nor the school district can suffer negative consequences as a result of a parent’s decision to opt their child out of the state tests. The STA strongly encourages our fellow members of the Smithtown School District to investigate this growing movement to help inform your decision on this very important topic. In addition to being educators, many of our members are parents themselves, and have spent a great deal of personal time becoming informed about the issues at hand. Despite New York State’s overreliance on high-stakes testing, which imposes consequences that harm our students, schools, and local communities, the STA values your child as more than a test score! As of January 1, 2017, we are once again affiliated with Davis Vision. 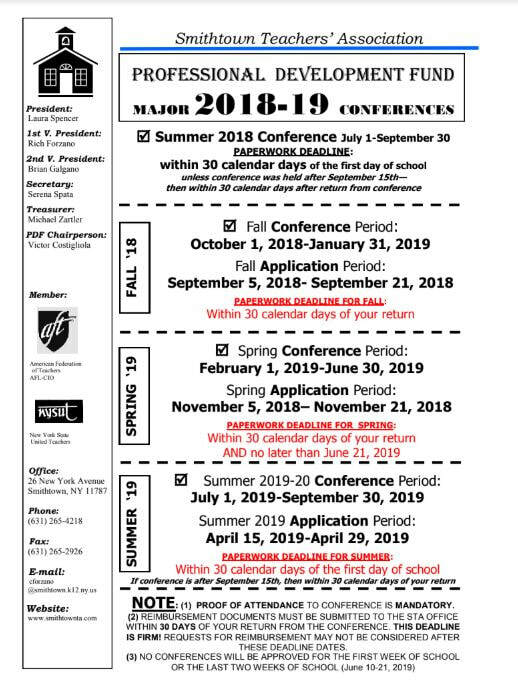 Click here to view the brochure. We are pleased to advise you that we are transferring our Dental Plan (ONLY) to Ameritas Life Insurance Corp. effective January 1, 2017. There will be no change to your current level of dental benefits. Please continue to mail Dental claims incurred PRIOR to January 1, 2017 to Brown & Brown of New York, Inc. d/b/a Fitzharris & Company for dates of service prior to January 1, 2017. Fitzharris will continue to process claims for dates of service prior to January 2017, however, ALL claims must be submitted to them by March 31, 2017. Claims received on or after April 1, 2017 will not be processed regardless of date of service. Ameritas will be mailing identification cards directly to your home. Should you need assistance or have any questions pertaining to your new dental carrier, please call Ameritas Life Insurance Corp of New York Group Service Customer Connections Department at 1-800-659-5556 after January 1, 2017. ...is now available online! Click here to check them out. Nearing retirement and want to stay connected with your colleagues? 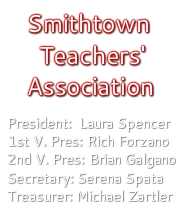 Join the Smithtown Schools Retiree Association (SSRA). It is NYSUT's Retiree Chapter for the Smithtown School District.